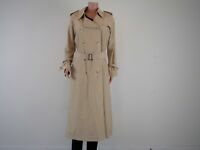 BURBERRY'S OF LONDON TRENCH COAT! WOMENS UK 12-14 ! 38-40 CHEST! JACKET! NOVA! ye_jan7 has no other items for sale. Burberry Women Dark Blue Nova Check trench Coat Size 10 US.